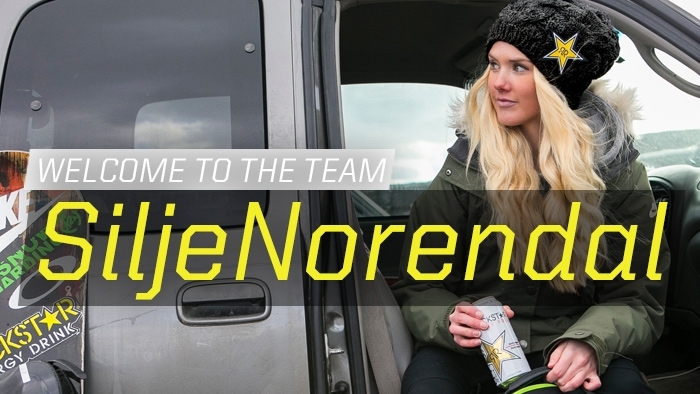 Los Angeles, CA (December 10, 2014): Rockstar Energy Drink announces sponsorship agreement with Silje Norendal. Silje Norendal is a leader in Women’s Slopestyle with recent decorations including Gold medals from Winter X Games Aspen 2014 and Winter X Games Tignes 2013. Silje joins Rockstar’s dynamic Rockstar snowboard team roster including top pros Torstein Horgmo, Chas Guldemond, Andreas Wiig, Spencer O’Brien, Frank April, and Matt Ladley. Silje will compete at the 2014 Dew Tour in Breckenridge, 2015 X Games in Aspen, and other top professional competitions. “I’m really excited to be a part of the Rockstar team. I’m happy to be a part of a brand that really cares about their athletes, and helps us on the road to progress and become better at what we do!” stated Silje Norendal. “She is a incredible addition to an already stacked roster of dynamic riders. We have very high hopes for her continued success.” stated Jason May, Executive Vice President of Marketing for Rockstar Energy Drink. About Silje Norendal: Silje was born in Kongsberg, Norway on September 1, 1993. She currently resides in Oslo, Norway and competes in slopestyle.